Jason Semenas is a peer mentor with the Recovery Foundation. That means he is in recovery himself – successfully – after battling addictions of every kind since he had a half a beer with his babysitter at age 10. And he is now helping others to achieve the freedom from addiction that he is enjoying. Jason is a walking and talking example that a long term addict can overcome his illness and gain control of his life. “If I can do it, anyone can,” says Jason. You can hear more of his story on this program. The Recovery Foundation makes long term recovery possible through the scholarships they provide to those who cannot afford treatment. 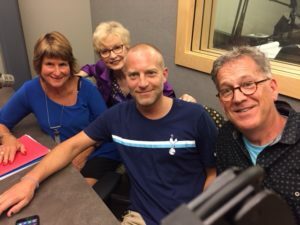 Jason is joined on this program by Shelly Dutch, founder and board member of the Recovery Foundation and Director of Connections Counseling and Chuck Callender, also a board member and Business Director of Connections Counseling. To make reservations, go to recovery foundation.net.